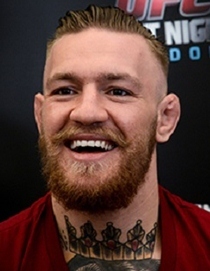 One of the top fighters in Ultimate Fighting Championship (UFC) at the moment, Conor McGregor is an Irish mixed martial artist born on July 14, 1988. Although football was his first passion in his youth but Conor decided to quit it in order to become a mixed martial artist. The professional career of him began in 2007 with an amateur fight after which he immediately turned professional and made his professional MMA debut in 2008. Although he suffered two loses via submission in his early career but then made a very impressive comeback and became the Cage Warriors featherweight and lightweight champion. 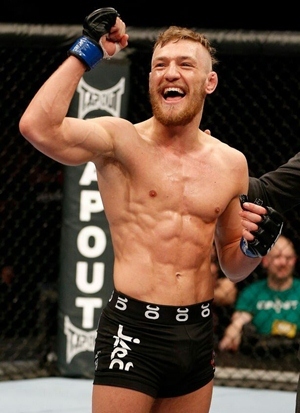 Seeing his spectacular performances, the Ultimate Fighting Championship (UFC) signed Conor McGregor in early 2013, making him the second ever fighter from Ireland to compete for the company. He won his first UFC fight against Marcus Brimage via TKO and since then, has defeated many top fighters like Max Holloway, Dennis Siver, Chad Mendes, José Aldo and Nate Diaz. 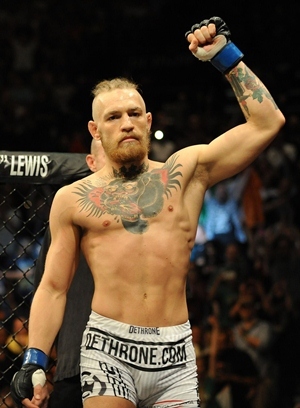 Below is the list of complete mixed martial artist Conor McGregor body measurements, including his height, weight, reach, chest, waist, biceps and shoe size. Although a vicious fighter now, Conor actually used to be bullied as a child. Prior to becoming a Mixed Martial Artist, he worked as an apprentice plumber for some time. While growing up, Conor McGregor’s first passion was football but he quit playing it and later stated that the reason behind doing so was “realizing it was for women”.